Avoiding falls from Vehicles will show on screen for download and we will email you a copy. Many falls from vehicles occur during loading and unloading - you don’t have to fall far to land hard. Fall-from-vehicle incidents can cost your company a lot of money. In 2004/05, the human and economic cost of the fall from- vehicle incidents we know about was over £36.5 million. 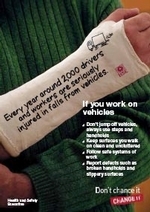 Falls from vehicles often result in serious injuries that keep skilled people, such as lorry drivers, off work for many weeks; agency workers might have to be employed to ‘fill in’, and deliveries may be delayed. More than 75% of major fall-from-vehicle incidents occur during loading and unloading activities. Fall prevention must be an integral part of planning loading and unloading and selecting the right kind of vehicle is an important part of this.